Victorious Lycee Francais International Georges Pompidou coach Fred Deswarte revealed that if there is a success to the French school’s success it is there commitment to hard work. LFI claimed back to back wins in the Emirates Islamic National School League Football Under-14 and Under-16 competitions at The Sevens on Saturday, and their head coach revealed their continued stranglehold on the competition has a lot to do with the time they have spent together. “I don’t know if there is a secret to success but in every team, in all sports it’s coming from hard work,” he said of his his U-16 side after they beat Al Ain Juniors 6-2 in the final, having earlier watched his U-14 side retain their title with a 4-1 victory against Wellington International School. “This generation has been working together for six years now. Training together two-three times a week for six years so maybe the secret is coming from hard work and spending time with each other. Although the U-16s have been together for a long time, the U-14s had nearly an entirely new roster for 2016/17, with sublime goalkeeper Hedi Hbaieb the heartbeat of their triumph. Although free-flowing going forward, LFI are far from flawless defensively, but even when the back line is breached, opposing teams have to get past a particularly talented and determined last line of defence. Hbaieb was called upon to save from Lewis Lee and Sarthak Suri in the final with LFI 3-0 ahead at half time thanks to man of the match Lyes Messaoudi’s hat-trick. Suri netted to give Wellington a glimmer of hope but Adam Germouni restored LFI’s lead almost immediately to seal successive triumphs. “I think the second title is better because you have to work hard and play hard, because every game is like a cup game,” added Deswarte. LFI had come through their semi-final earlier in the day with a 1-0 win against Al Ain’s Our Own English High School, a game in which Hbaieb was again in fine form. Wellington had gone behind to NIMS Sharjah in their last four clash but fought back with Malek Abdelnaser’s brace and one for Mahmoud Wahbeh sending them through. Lycee Francais International Georges Pompidou confirmed their status as Emirates Islamic National School League Football royalty as they retained both their under-14 and under-16 titles. Frederic Deswarte’s men brushed aside tournament debutants Al Ain Juniors 6-2 in the U-16 showpiece at The Sevens on Saturday, while their younger counterparts similarly met little resistence as they swept to a 4-1 win in the U-14 final against Wellington International School. It capped a superb 2016/17 campaign as the French school rampaged to the double double, following on from their success in the inaugural NSL Football campaign 12 months ago. For two of the goalscorers in the U-16 final, victory was particularly memorable. Chanin Hamdaoui and Tom Kassis cemented their reputations as men for the grandest stage as both netted having played pivotal roles a year ago. Just as LFI repeated as champions, Hamdaoui reprised his role as star man as he took away the man of the match accolade for the second year in a row. The 15-year-old, who scored in the 2015/16 showpiece, was at the core of LFI’s triumph, bagging a brace of both goals and assists while also working tirelessly for the cause. “I stayed focused and just did what I had to and think about the victory,” said wideman Hamdaoui. “To be man of the match in the final for the second year in a row, it’s good, I am happy. I’m so happy I have no words. “I think this second win feels more special than the first. It’s always harder to win it the second time. We were the team everyone expects to win and if we lose everyone would be happy to beat the champions. “Because of that the games were tougher. More teams knew about us and we lost too in the groups. It was hard to come back from that but the coach knew what to do and we came back stronger, and we saved our best performance for the final. Team-mate Kassis, also 15, also got on the scoresheet, a year after he was the catalysts for the U-14s epic victory against Al Salef Sal Saleh Private School. In a thrilling 2015/16 U-14s final, Kassis bagged a hat-trick, the third of which was a golden goal clincher in extra time that handed LFI victory. He has gone from being the senior member of that squad to the “baby” of this year’s vintage, and he will still be eligible next season, and hopes he can be a treble champion. “It’s special to score in two finals, incredible,” said Kassis, also 15. “Last year I scored a hat-trick and this year I scored once. I’m as happy as I was last year. Last year it was an incredible game. We were leading then we were behind and I scored the golden goal in extra time. If the purists were hoping for an even contest it failed to materilaise as the defending champions went ahead inside the first minute through captain Thomas Rousse’s opener. There was a moment of controversy when Al Ain’s Mohamed Sajid saw his effort ruled out for a foul on LFI goalkeeper Angelo Vitale. LFI took full advantage as Hamdaoui doubled the lead when he caught stopper Abdul Aziz out at his near post. Another error from Aziz saw him spill Kassis’ shot into his net and even though Al Ain launched a spirited fightback in the second period, reducing the arrears to 3-1 and then 4-1 through Ahmed Ashraf and Mohamed Ayman, Hamdaoui and Rousse completed their braces while Ralph Charaf also netted to seal deserved back-to-back titles. LFI sauntered into the final in similarly comfortable fashion, beating Our Own English High School Al Ain 4-0 in the semi-finals. The other last four clash had been a titanic clash in which Al Ain came from a goal down to triumph 2-1 over GEMS Our Own Indian School in extra time. Tom Joseph opened the scoring for GEMS and the writing looked on the wall when Sajid blasted his penalty wide. GEMS had plenty of chances to seal a date with LFI but twice hit the post. Sajid then atoned for his earlier miss when he rose to nod in Ashraf’s cross inside the final minute. The drama wasn’t over and in the extra period, Sajid completed his personal see-saw of a game when he lashed in after a long punt up field with seconds remaining to send Al Ain through. Sajid felt that herculean effort had drained his side. “I think that game had taken it out of us both mentally and physically,” he said. “I don’t think we had anything left after the way we reached the final. Everyone had prepared for that match first so it was difficult in the final. All Dubai International Academy coach Jo Terry will be asking from his players this weekend is that they give their all and leave it all out on the field. 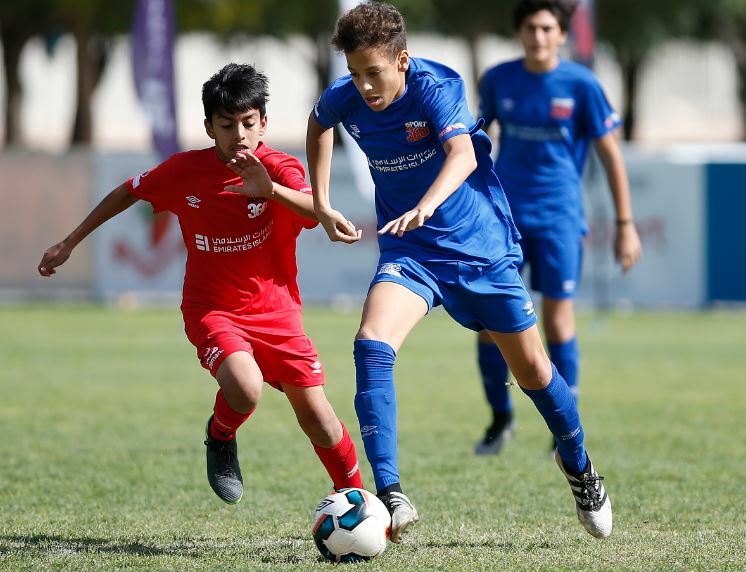 DIA head into the inaugural Emirates Islamic Under-12 National School League Football finals on Saturday fresh off a commanding performance in the group stages at Dubai’s Koora Dome last weekend. Terry’s team were statistically the second-best performers on the day, scoring an impressive 17 goals as they won all four of their Pool 4 games against GEMS Modern Academy, Our Own English High School Fujairah, Mayoor Private School and JSS International School. DIA only conceded once to storm through to Saturday’s finals day where they will face JSS Private School in the quarter-final. Terry says his team go into every tournament they play chasing the trophy, although he will be satisfied as long as his team give 100 per cent. “Confidence is high but the boys will need to perform at their best to win,” he said. The format of the U-12s tournament is five-aside and although that’s a little different to the full 11-aside games DIA usually play, Terry insists his players always play the right way, which is why he is confident. He added: “We trained Tuesday, which was a very good session and we’re prepared. We thoroughly enjoyed the tournament last weekend, where the boys linked up well. 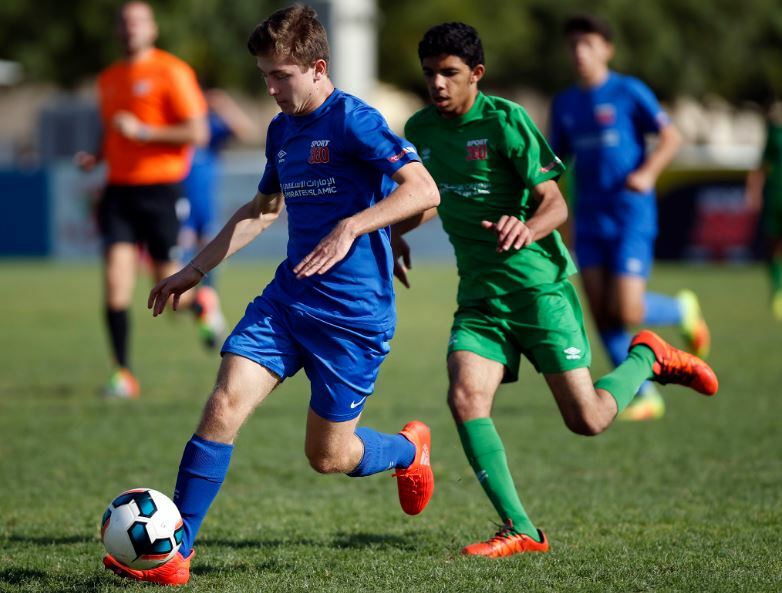 Elsewhere in the draw, Dubai English Speaking College will be another team to watch out for, having secured their last eight berth with a mighty 24 goals scored and none conceded in their four wins in Pool 1.